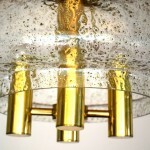 Beschreibung: Hochwertig ausgeführte höhenverstellbare Deckenlampe aus vergoldetem Messing. 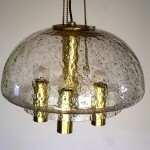 Großer handgemachter Glasschirm mit Goldeinschlüssen. 4 Glühbirnen. Guter Zustand – der Schirm hat am Rand 2 minimale Chips. 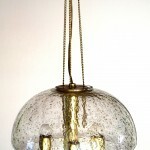 High-quality, height-adjustable ceiling lamp made of gilded brass. 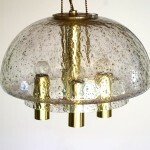 Large handmade glass umbrella with gold clasps. 4 light bulbs. Good condition – the screen has at the edge 2 minimal chips. 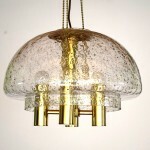 High-quality, height-adjustable ceiling lamp made of gilded brass. 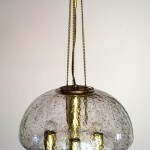 Large handmade glass shade with gold inclusions. 4 light bulbs. Good condition – the shade has at the edge 2 minimal chips.